Our daughter Lacey was born in October 2010 with a normal shaped head, although at the time we didn’t realise, we soon noticed that Lacey’s head was always turned to the left whenever she was lying down. Around 4 months (February 2011) this caused concern and we decided to take her to out local GP. We were told that Lacey more than likely had torticollis and referred us to a NHS physiotherapist, who weren’t very helpful. The GP and health visitor were not concerned over the shape of her head at all, and told us that her head would correct itself when Lacey got more active. We used special cushions to try and help Lacey but nothing seemed to make a difference because of the torticollis, it was her preferred side.Because of Lacey’s abnormal headshape, Lacey’s ears were not straight and also her eyes were slightly out of line. This made our mind up, after many discussions with my husband and family we decided that going private to Lisa would be the best option. We didn’t want to take the risk of Lacey having several problems when she was older like not being able to wear a bike helmet, hats and glasses. Lacey’s torticollis soon improved by doing simple everyday exercises. I found out about Vitality in Motion through the internet and realised this was the closest one to us. I first emailed Lisa with pictures of Lacey’s head and got a promt reply, I was very impressed with her response, Lisa thought Lacey had plagiocephaly on her left side with slight brachycephaly running across the middle of her head. We made an appointment straight away to vist Lisa in Cardiff, just over a 4 hour round trip from our home in Cardigan, West Wales. After our first consultation and scan, Lisa confirmed measurements and what she predicted by the pictures via email. We without a doubt decided to go ahead with the treatment, we chose a pink design then Lisa ordered Lacey’s helmet, we returned a couple of weeks later to collect it. We started weaning her onto the helmet the very next day. 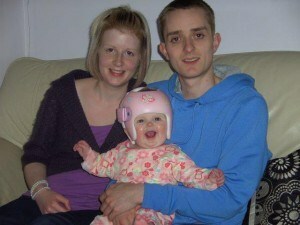 We were told that Lacey would be in her helmet for 6 months minimum and Lisa was correct! It made such a dramatic change to her head shape, luckily we caught lots of growth spurts so noticed a big change very soon! Our local community really helped us with the funds for ‘STARband for Lacey’, we had front page in our local paper, shops, charities and local people all arranged events to raise the money. Lots of family and friends also donated through justgiving.com with HeadStart4Babies – who were always very helpful with transferring money to Vitality in Motion. We ended up raising double the funds and the rest has gone to help another family in our situation. Lacey was always happy in her helmet and adapted surprisingly soon. As parents, it was hard to accept that our child wasn’t ‘the perfect baby’ but who’s is? She attracted a lot of attention and differences of opinions around the place but it was all for the best and was only for 6 months of her life. Lisa was helpful, supportive and always so good with Lacey. Lisa always explained everything in thorough detail and we were very pleased with the service we got from her. Every appointment she measured Lacey’s head and altered the helmet where growth had happened. If you have any concerns over your child’s head shape I would recommend Lisa highly as you will get nowhere with the NHS as their attitude is this problem is COSMETIC, which is ridiculous with some of the things they have been paying out for recently! We will never know for certain what caused this problem but we have never looked back at getting Lacey’s helmet, it has 100% worked and we did feel guilty by putting her in a helmet, but it caused her no pain and she was as happy as ever, so we soon got used to it as a family, and that’s all that mattered. Our long trips with a 6 month old baby to Cardiff were definitely worth it and we are very pleased with the results, so a massive thank you Lisa, our time with Lacey’s head shape could have been a lot more difficult, we will showing Lacey lots of pictures and telling her many stories when she’s older, with thanks to you.